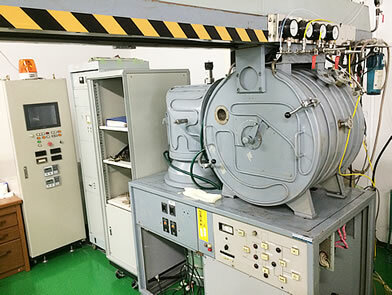 Radio Frequency Magnetron System | Thin Films and Surface Modification | ShinMaywa Industries, Ltd.
What is Radio Frequency Magnetron System ? Radio Frequency Magnetron System can form teflon coating that is an ultra thin film. It is a sputtering method using radio frequency (13.56MHz) which targets solid material of Teflon. Teflon is also used to improve cutting quality (sharpness) of razor blades due to low coefficient of friction. The feature of this system is that it forms super thin films (in microns order) with high uniformity. It can also apply to metal and graphite etc. in addition to organic/non organic insulators including Teflon. The upper figure shows water drop on teflon film on the glass substrate. The under figure shows water drop on the solid teflon substrate. Surface coated with teflon thin film shows chemical and thermal stability and low coefficient of friction. Teflon film can be deposited on top of DLC or TiN as additional lubricating film. Mold release characteristics for polymer materials is advanced that teflon films can be applied as a mold releasing agent.